Perform Chromatography Easily -- without expensive equipment! 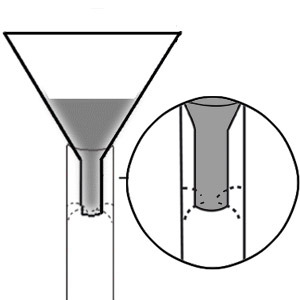 Plastic Chromatography Funnels are unbreakable and made of chemically resistant high density polyethylene (HDPE). The funnels have unique closed stems and small holes in the side toward the stem bottom. This design facilitates the gentle addition of solvent by flowing down the column wall, making these superior to ordinary funnels. No machinery needed! Great for university laboratories and academic experiments.